Divine Dimensions 2006 - An Exhibition Of Paintings By Bala Bhakta Raju is an event that took place between 24-Aug-2006 and 29-Aug-2006 in Hyderabad. Lord Ganesh is becoming omnipresent. He is on the roads, inside water, and now even in paintings exhibitions. 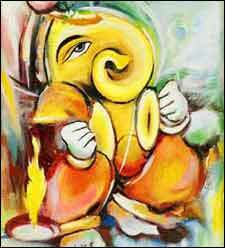 With Ganesh Chaturthi approaching, Bala Bhakta Raju is exhibiting his paintings in acrylic and water colours on Lord Ganesh entitled, "Divine Dimensions 2006", with the exhibits available for view from the 24th of August till the 29th. Bala Bhaktha Raju's fascination for Lord Ganesha dates back to his early childhood days and continues to grow by the day. He tries to capture the many moods and expressions of the Lord, by his brush, knife, water and acrylic colours and through a blend of modernity and tradition. The exhibition will be inaugurated on 24th August, 4 PM at the Lakshana Art Gallery, by the chief guest K R Suresh Reddy. The special invitee for the evening will be Mohammed Ali Shabbir, Minister for Information and Public Relations, Energy and Coal. Bala Bhaktha Raju will be available for contact at 98661-98664, or contact the Lakshana Art Gallery at 2337-8033 for further details. Be the first to comment on Divine Dimensions 2006 - An Exhibition Of Paintings By Bala Bhakta Raju! Just use the simple form below. fullhyd.com has 700,000+ monthly visits. Tell Hyderabad what you feel about Divine Dimensions 2006 - An Exhibition Of Paintings By Bala Bhakta Raju!